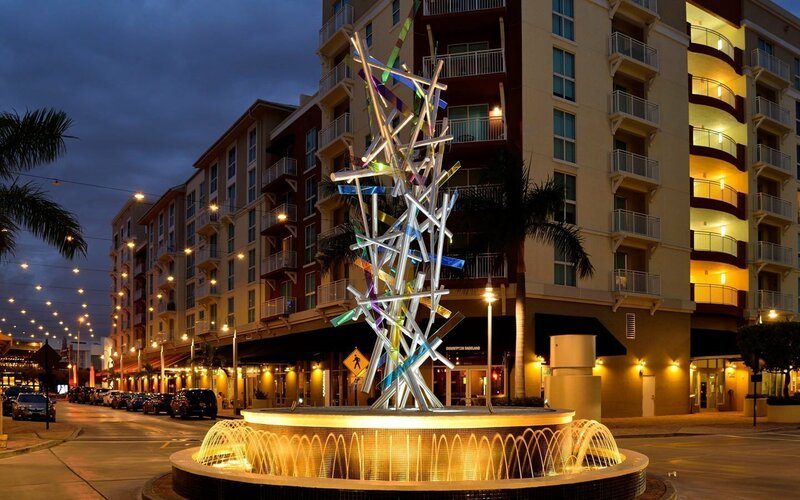 Southern Florida’s picturesque sunrises and sunsets, dazzling ocean surfaces, and abundant flora and fauna serve as inspirations for Spectrum. 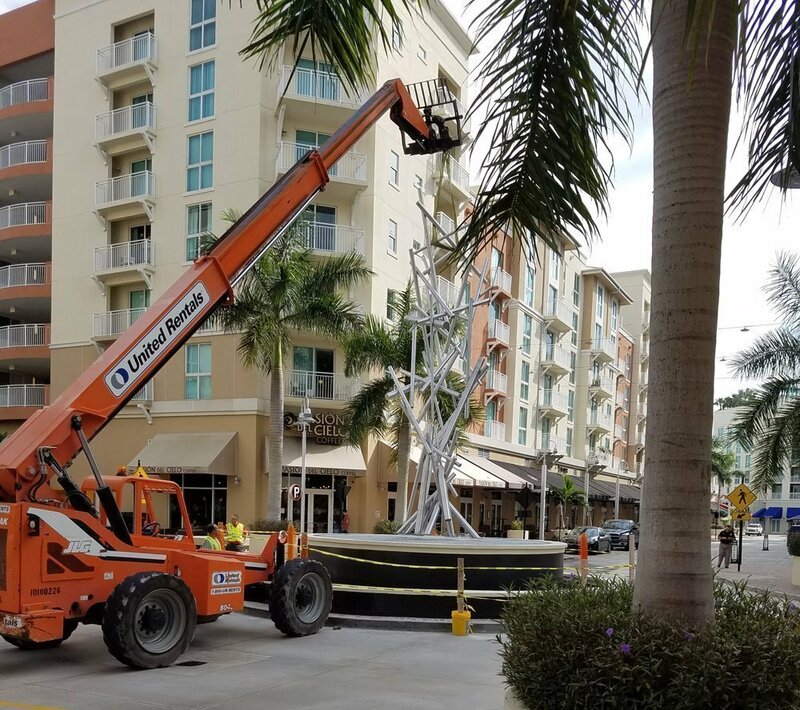 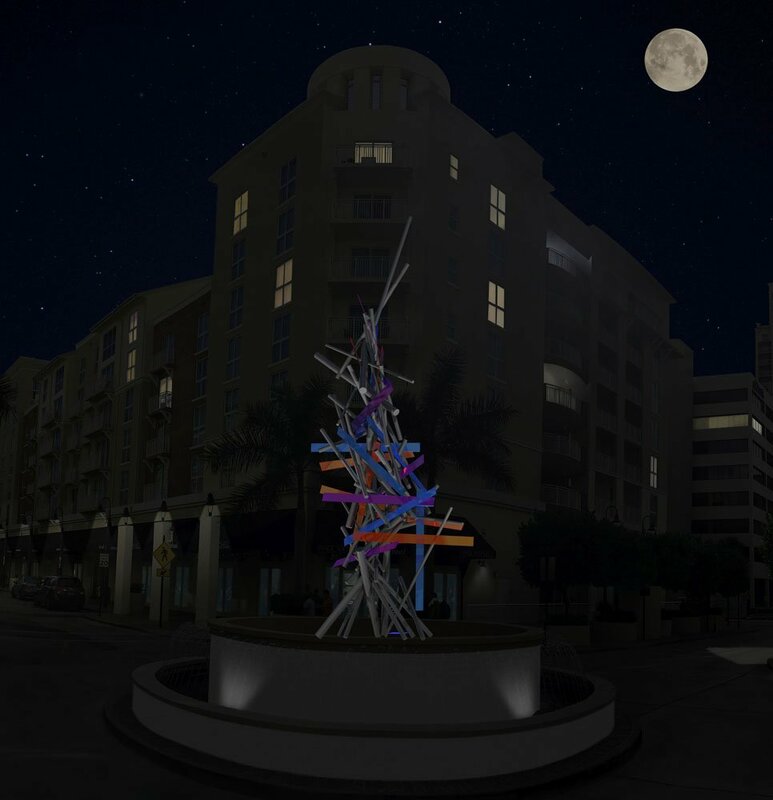 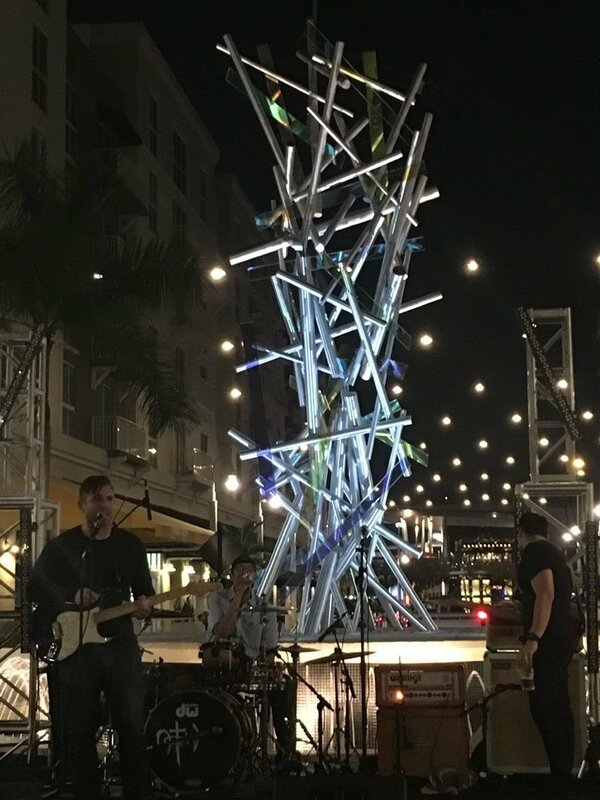 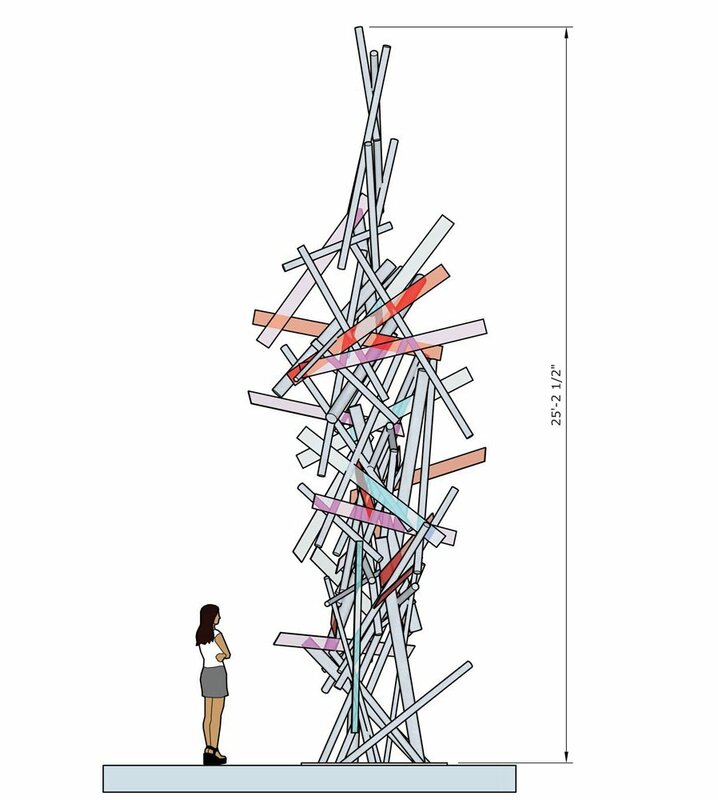 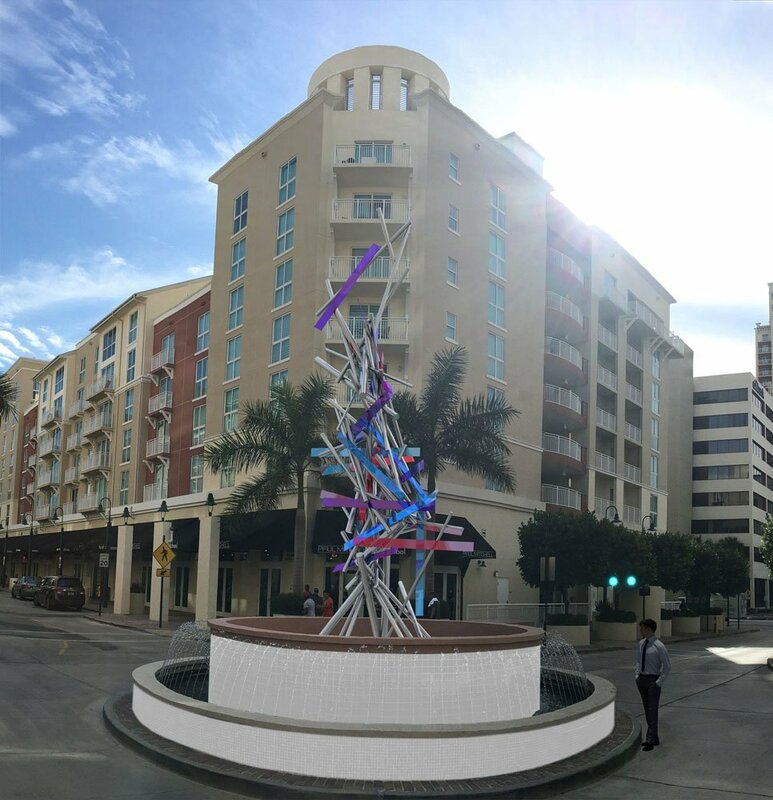 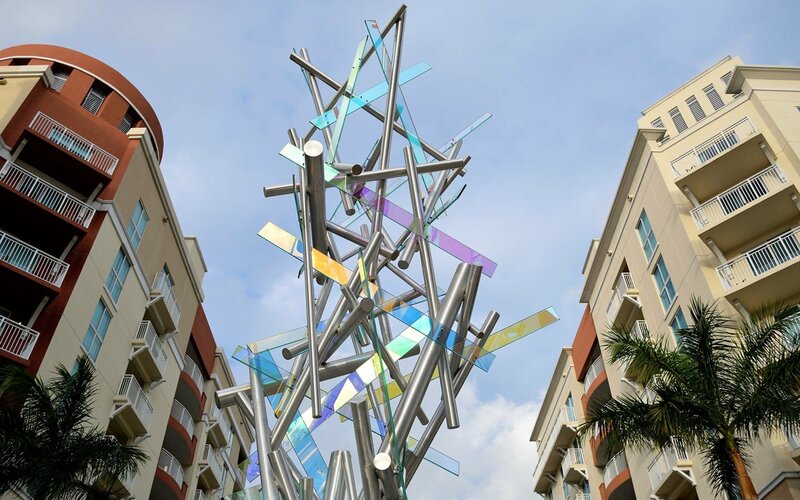 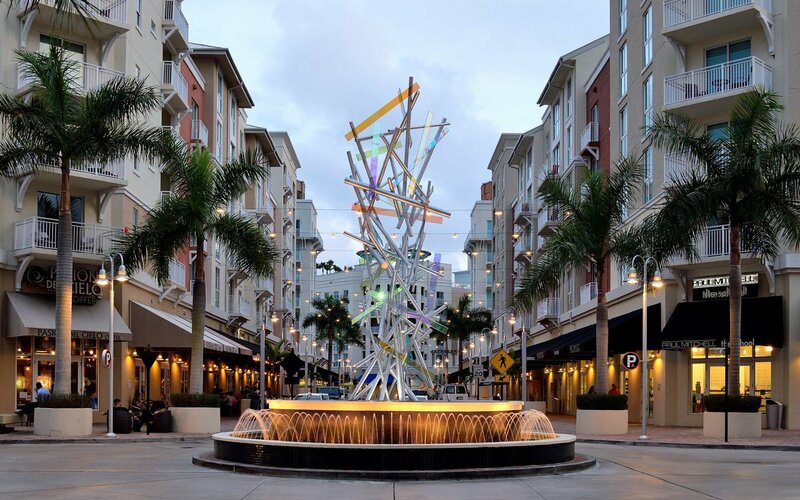 Commissioned by developers, Duncan Hillsley Capital, the artist was asked to create an “art experience” for Downtown Dadeland, an upscale retail and residential destination located in the Miami area. 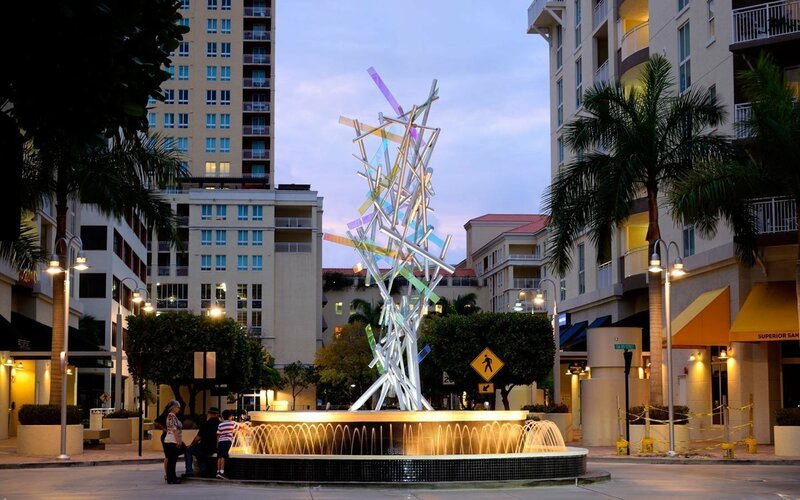 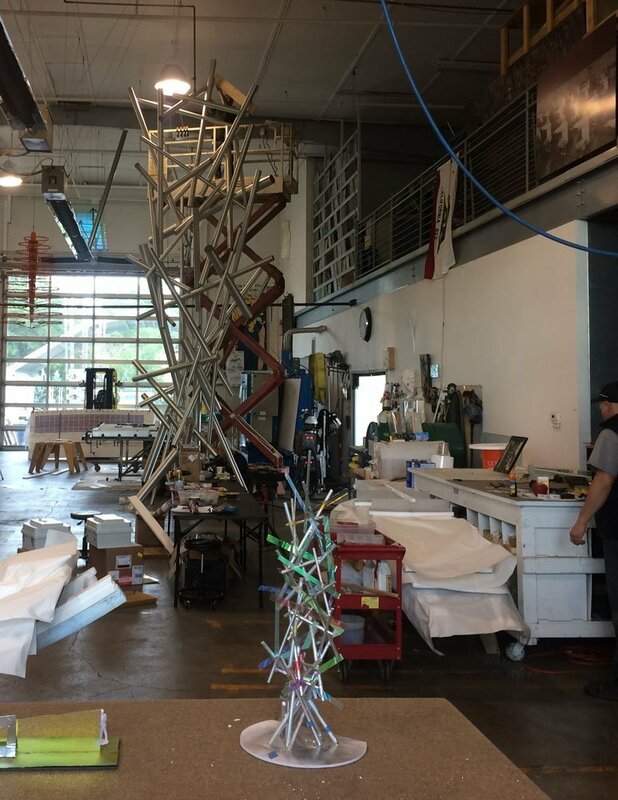 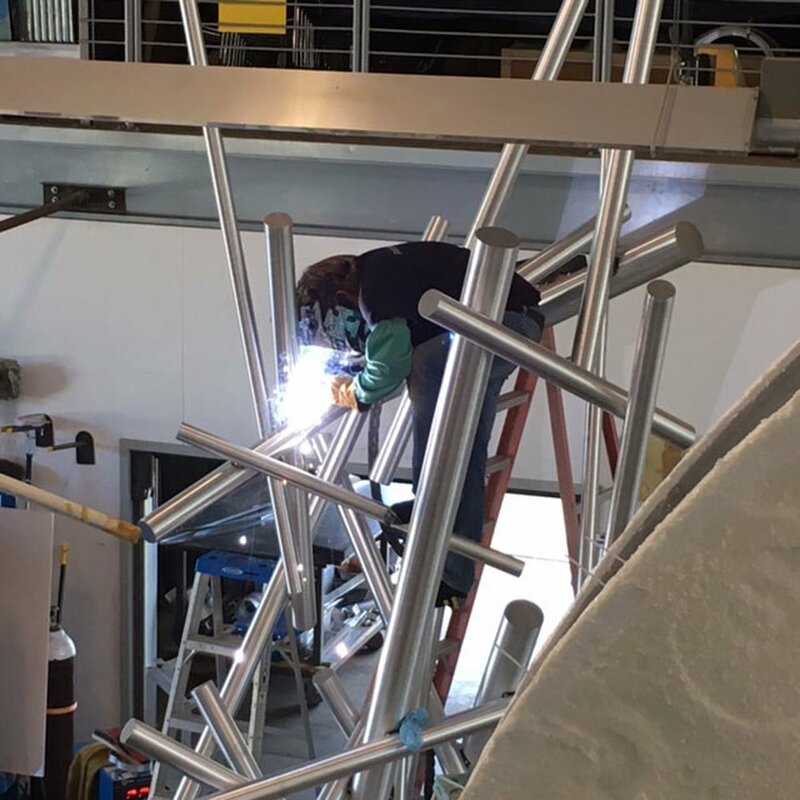 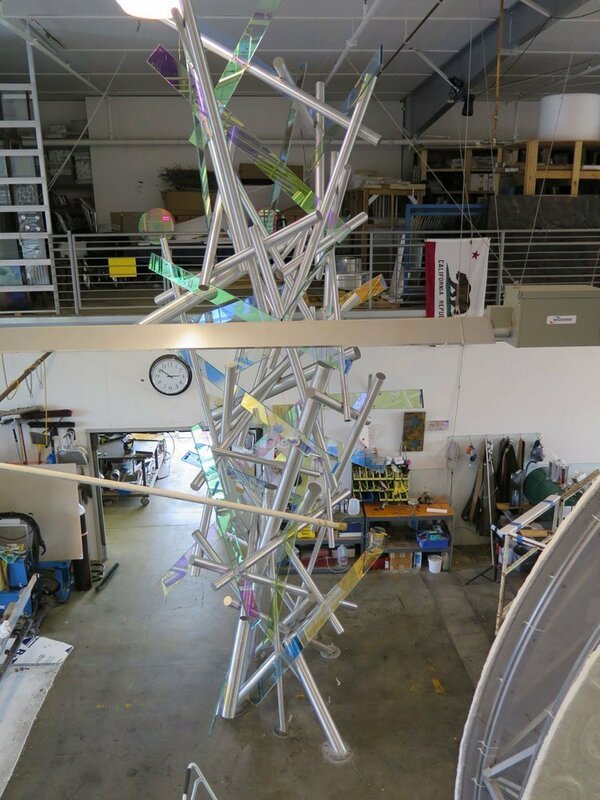 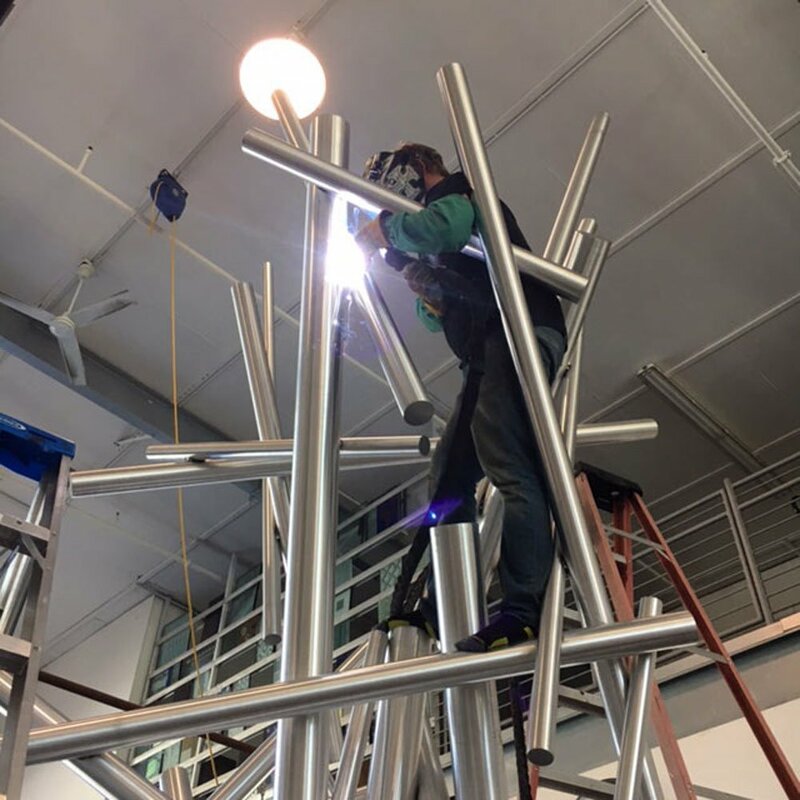 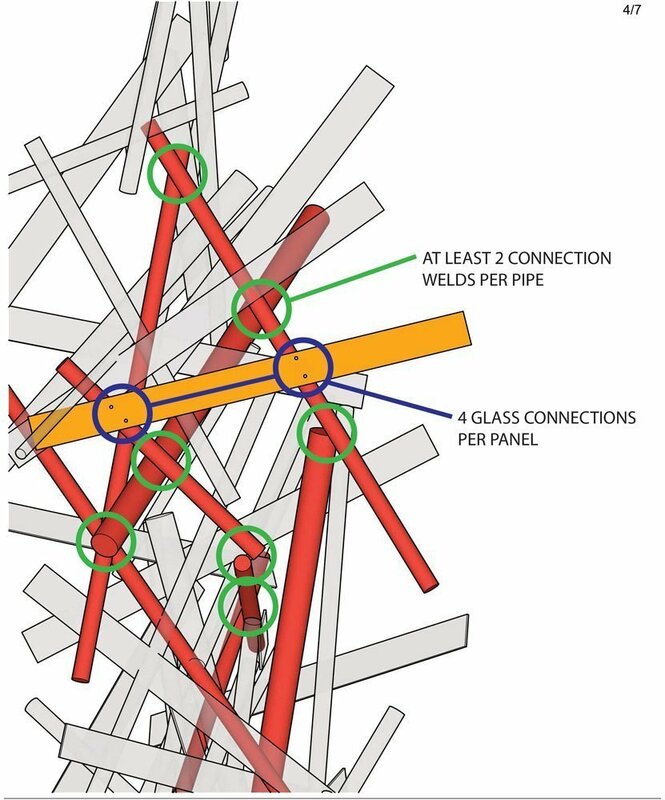 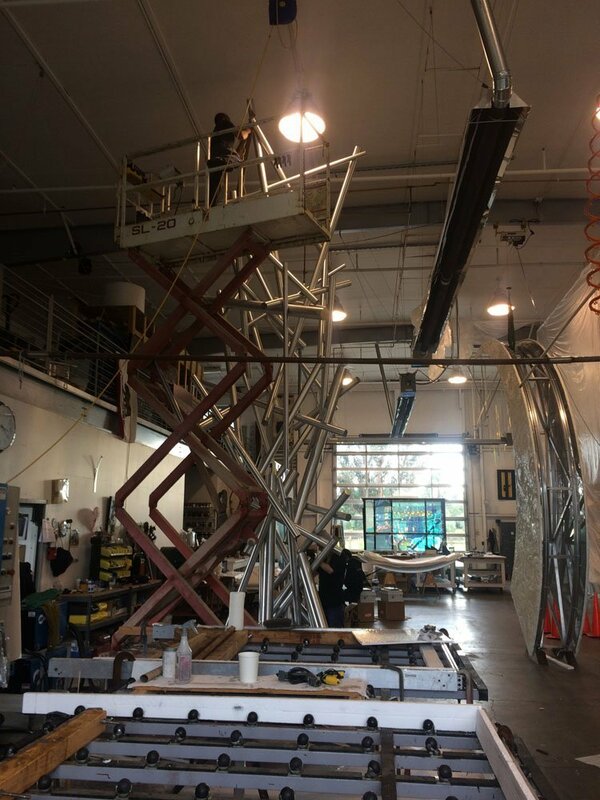 The resulting 25-foot tall sculpture, with an approximate footprint of nine feet, is constructed with brushed aluminum and dichroic glass panels, each carefully fastened with bespoke engineered fittings. 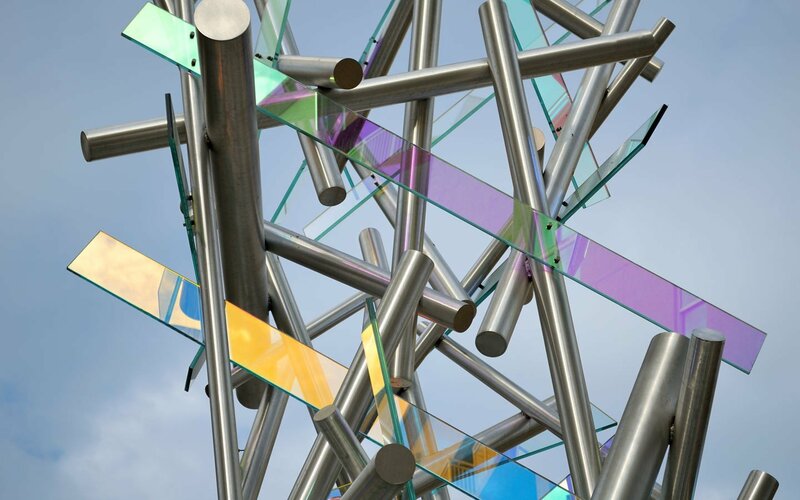 Light and its manipulation have been an area of focus and core element of Huether’s work throughout his career. 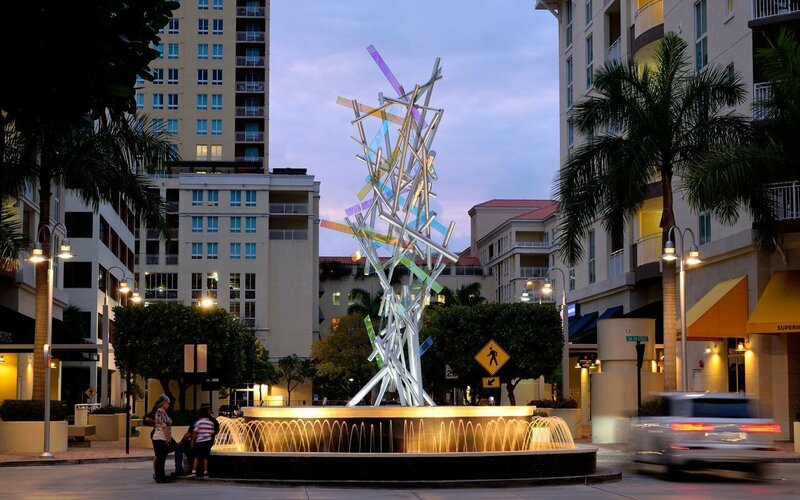 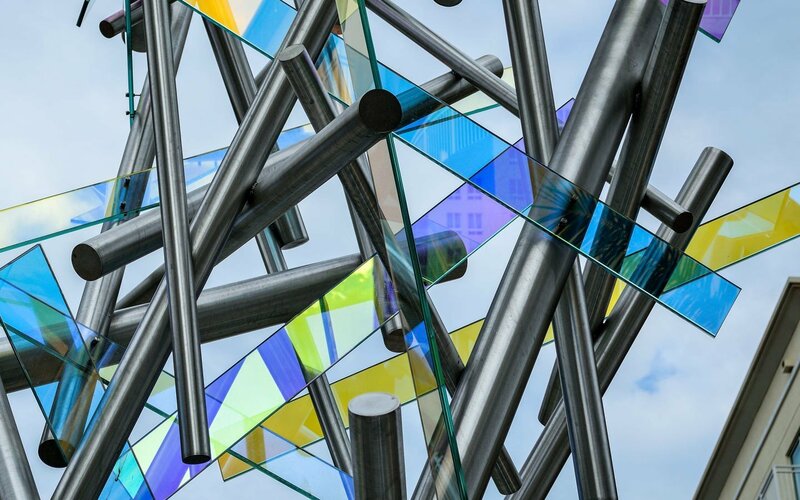 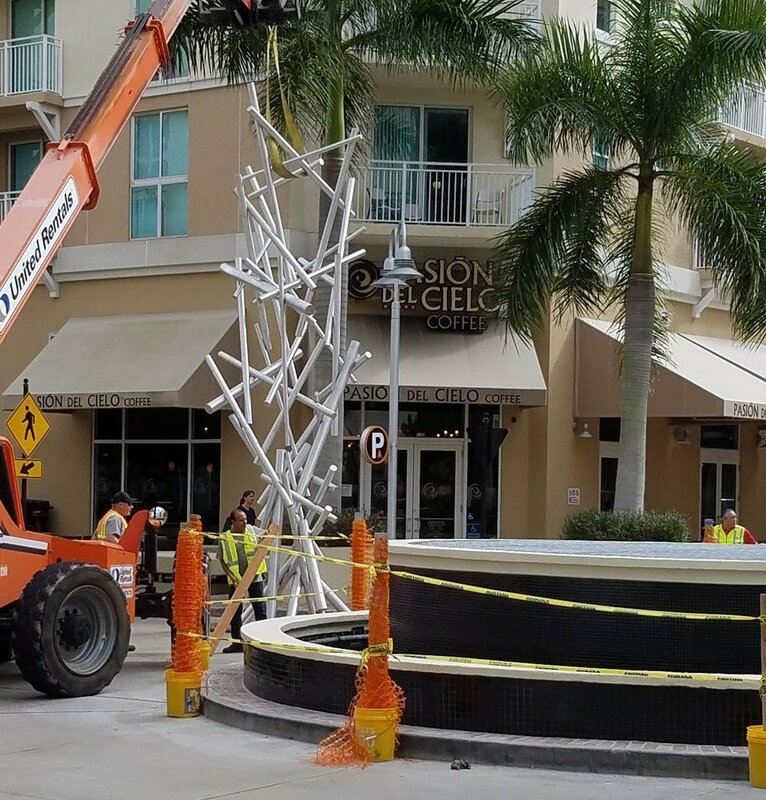 This sweeping sculpture and focal piece for Downtown Dadeland adds a magnetic allure and brilliance to one of the nation’s most sophisticated retail developments. 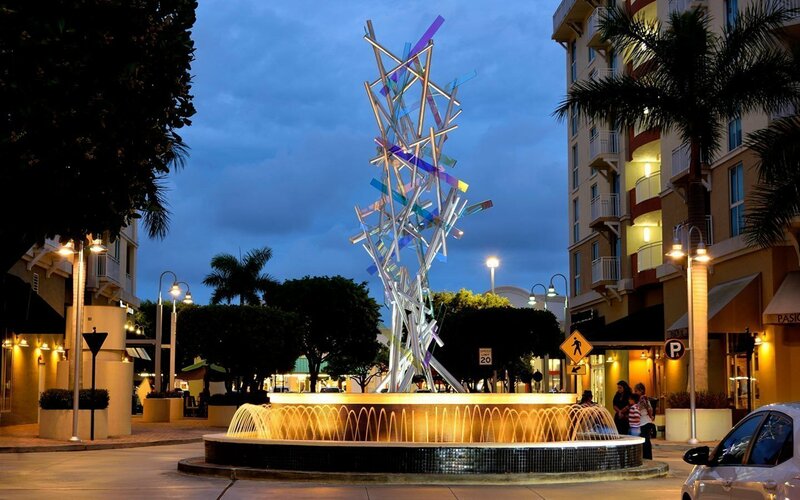 It was important to Huether that Spectrum contributed something beautiful, as well as positive to Downtown Dadeland. 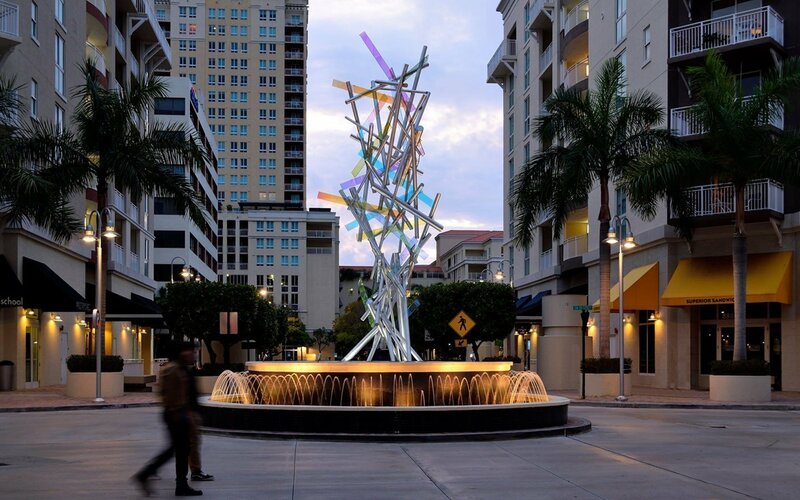 The work has a distinctly optimistic and uplifting presence and encourages viewer engagement, through its implementation of dichroic glass interacting with the ever-present Florida sunshine. 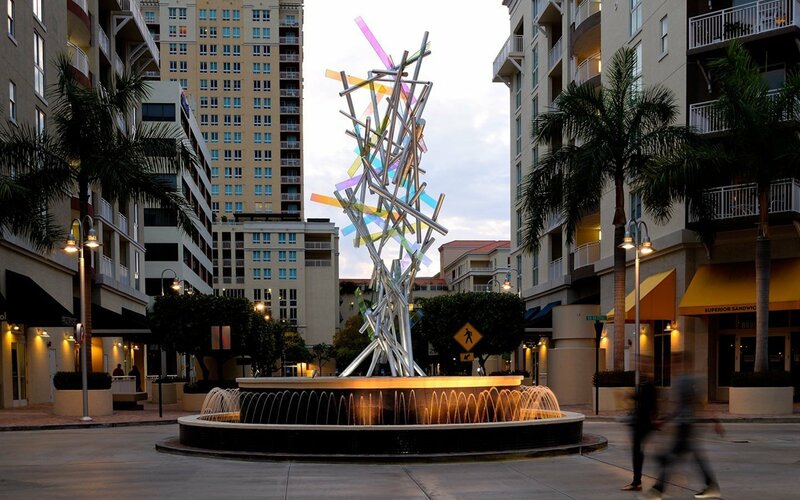 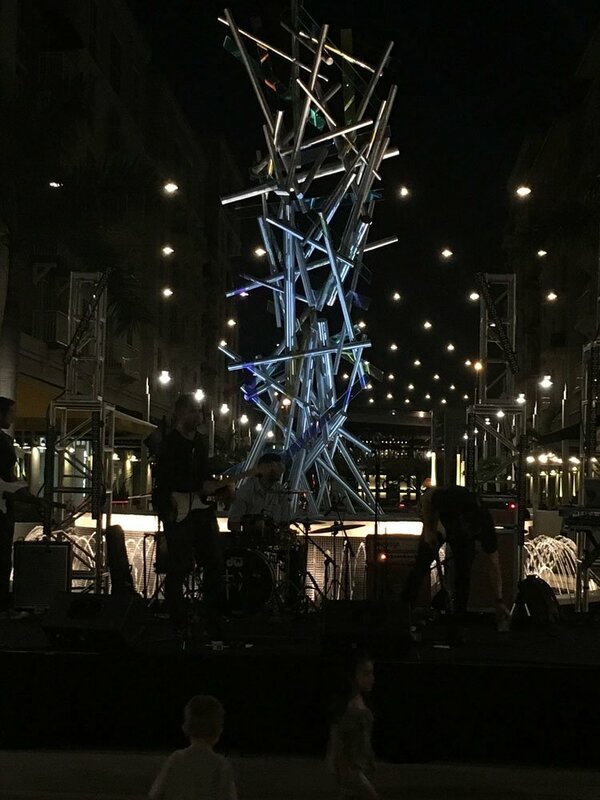 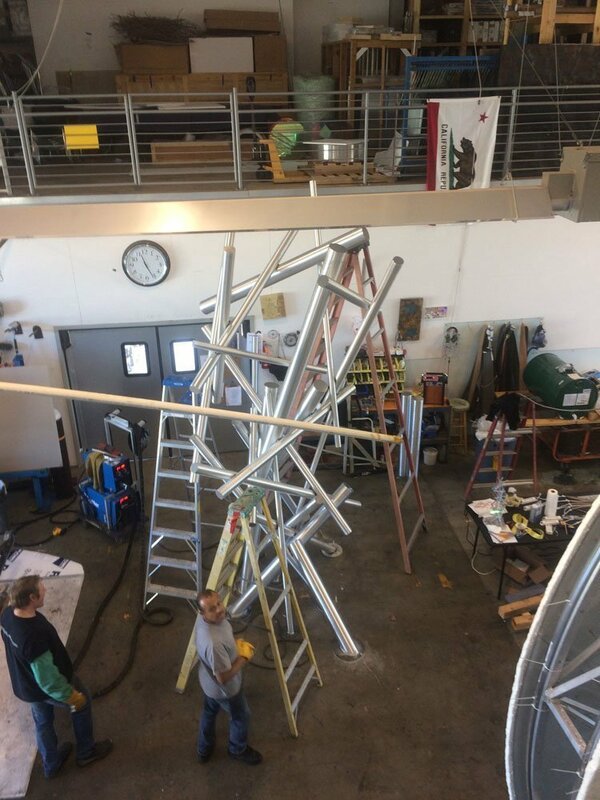 Warmly welcomed by the community, Spectrum has become a beacon for visitors and residents who use the sculpture for photo ops and as a gathering space. 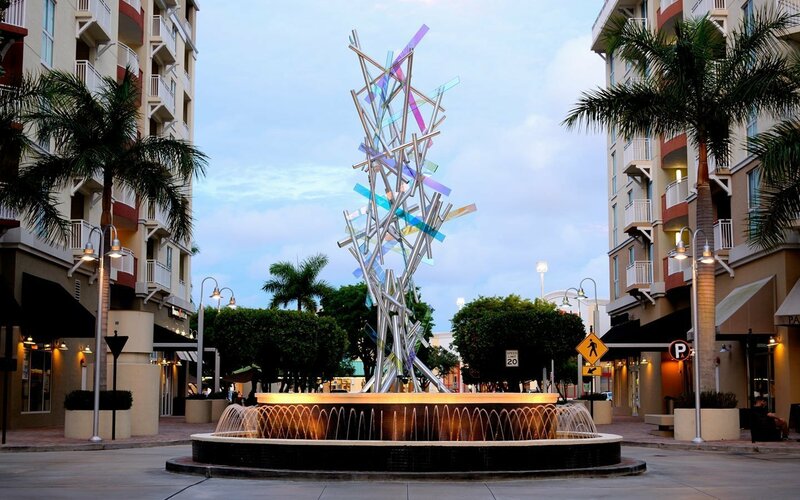 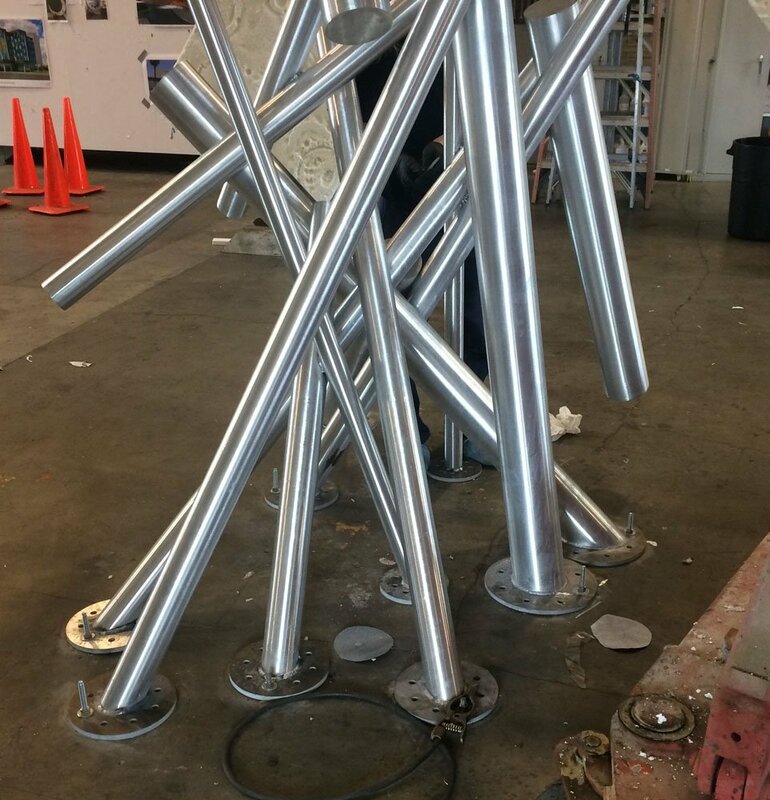 Spectrum also acts as a way-finding tool, helping visitors orient themselves while exploring Downtown Dadeland.